So far 9 easter eggs have been found in Assassin’s Creed 3, watch gameplay videos of them all below. 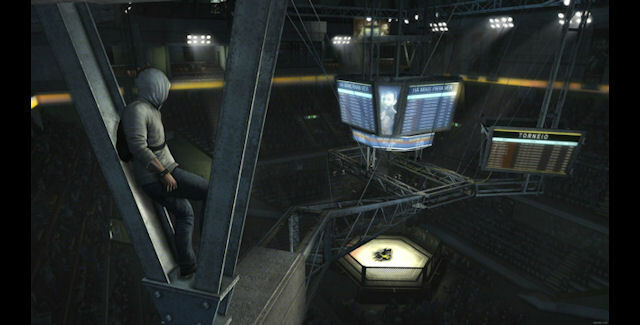 Here’s how to find the stadium Ultimate Fighting Championship (UFC) mixed martial arts (MMA) match in Assassin’s Creed 3. It can be viewed at the start of “Desmond Sequence 1: Daddy Dearest” in “Mission: Present – Stadium”, where you can attend a UFC fight in Brazil. Normally during this mission you’ll be too busy chasing someone down while avoiding security. But pay attention once you reach the catwalk that goes over the Octagon arena! Instead of walking past it you can actually watch the fictional MMA match between Guilherme Venancio VS. Luis Otavio Duris. You might recall in Assassin’s Creed 2 there was a Giant Squid hidden in the water of the Santa Maria Delle Visitazione assassin’s tomb. This time around in Assassin’s Creed 3 the developers have hidden the Loch Ness Monster! Loch Ness can be found in The Frontiersman Mission through the “Monster of the Sea” sidequest, in which you have to listen to conversations around town. Go into a pub (shown in the video below) to see that sidequest name appear above a table of talking men, so sit in on the rumor discussion. Now that it’s active, go eavesdrop in on people talking about it around town, it’s indicated on your map so the three groups of talking people are easy to find. Apparently a man died at sea in his scuba gear while investigating this American Sea Monster, was he eaten by Nessie!? During the Frontiersman Mission you can start the “Finding The Sasquatch” mission! During the Frontiersman Mission you can start “The Headless Horseman” mission! During the Frontiersman Mission you can start “Unidentified Flying Object” mission! During the Homestead Mission you get to fly Leonardo Da Vinci’s flying machine from the previous Assassin’s Creed game. At the end of the “Boston Brawler” sidequest at the tournament against the Surgeon, the announcer says “Dance like the best, fall like the rest” which may be a reference to the movie “Hackers” line “Mess with the best, die like the rest”. Here’s how to find a turkey that wears the Assassins hood! At the Davenport Homestead manor in Sequence 6 (or later), you should stand around the corner to the left of the front of the manor and whistle. A turkey will sneak up on you from the bushes behind you. Now stand in front of the turkey and press the Konami code in-game: Up, Up, Down, Down, Left, Right, Left, Right. This will activate the easter egg and give the turkey an Assassin’s hood while feeding it! He or she will also keep following Connor around everywhere. Additionally, the image at the top of this page comes from Ubisoft’s official Assassin’s Creed 3 Hacked History webgame. The picture of the fighter in the image even includes a QR Code at the bottom, which translates into “Desmond”. That’s the password to access this Assassin’s Creed 3 page. The Ubisoft website then concludes the webgame by showing the Assassin’s Creed 3 “Previously On…” Desmond’s story recap from the game’s intro. It’s narrated by Desmond’s father, the leader of the Assassins, showing them making ready to save the world. Have you found any Assassin’s Creed 3 easter eggs?